A mental health treatment supplement called Coping Cards was announced in conjunction with National Suicide Prevention Awareness month. Carlsbad, CA, September 07, 2018 --(PR.com)-- Today a new supplemental mental health therapy solution campaign called, “Coping Cards” was launched on Kickstarter.com. The timing was chosen in part because September is Suicide Prevention Awareness Month and the campaign is being launched in advance of National Suicide Prevention Week, which runs from September 9th through the 15th. Coping Cards are small index cards that contain positive affirmations, quotes and phrases for use when experiencing anxiety, stress, anger or depression. 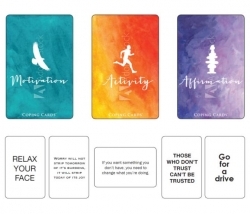 The Cards are portable and thoughtful reminders to combat negative self-talk. Coping Cards were created by Jeff Holland, who has started a new campaign to seek funding on Kickstarter to try and bring this concept to reality. Kickstarter helps people find the resources and support they need to make their ideas into reality. To date, tens of thousands of creative projects – big and small – have come to life with the support of the Kickstarter community. Holland’s funding goal to get the project into production is $15,000, which would cover the creative, print setup and initial production run. If the goal isn’t met within 30 days, no money is collected in accord with Kickstarter’s rules and funding conditions. Holland created Coping Cards with the help of his wife, who is a licensed Marriage and Family Therapist, as a result of witnessing a family member struggling with mental health issues. He noticed that she had hand-written notes posted throughout her house with various motivational passages, suggested activities and positive affirmations. Following that, he thought, “What if there was a card kit -vetted by healthcare professionals - that people could use as part of their treatment program?” Coping Cards were born. “Whenever something gets you down, you can pull out a Coping Card to help you calm down and stay in control until you feel better,” says Holland. “It sounds simple, but it does work.” Holland also created a short video to provide further explanation on the project and the Cards. According to the National Alliance on Mental Illness 1 in 5 – nearly 44 million – U.S. adults will experience a mental health condition in a given year, and nearly 22 percent of children between the ages of 13 and 18 will experience a serious mental disorder in their lifetime. Even more critical, 90% of people who die by suicide experience a mental health condition. The best treatments for serious mental illnesses today are highly effective; between 70 and 90% of individuals have a significant reduction of symptoms and an improved quality of life with the right treatments and support system. Coping Cards are meant as a supplement to those treatments. These cards are only intended to help and support a well-thought-out treatment plan and not a cure for serious mental health issues. If you are having depressive thoughts or feelings of suicide, please contact your healthcare provider or call 911.